This Super Snack Time jerky brand name is distributed by Brandable, located in Beverly Hills, California. Super Snack Time specializes in making crazy foods, and posting online videos about them. The company was founded by Harley Morenstein from Epic Meal Time. They currently offer products such as pepperoni jerky, supreme pizza jerky, uncured bacon jerky, and taco in a bag. The beef and pork used is not guaranteed to be free of growth hormones or additional antibiotics. Also, the beef is not guaranteed to have at least partial free range access to graze on grass. As a result, the highest ingredient rating that can be awarded is a Good (8/10) rating. The texture of this jerky is chopped and formed, or something similar. As a result, without having a natural whole muscle sliced strip of jerky, two ingredient ratings are deducted. The liquid marinade used here is a good brand of tomato sauce, a decent brand of soy sauce, water, an average brand of Worcestershire sauce, healthy honey, and a decent brand of lemon juice. It is disappointing to see that the Worcestershire sauce uses the highly processed sweetener high fructose corn syrup (HFCS) to lose a rating. There are multiple healthy ingredients added such as olives, bell peppers, garlic, spices, mushrooms, onion, oregano, basil, red pepper flakes, cayenne pepper, parsley, black pepper, thyme, and rosemary. The sugar level is respectable at 2 grams of sugar per 28 grams of jerky. The salt level is high at 440mg of salt per 28 grams of jerky. However, the salt levels are ignored because minimally processed sea salt is used here. This jerky does not qualify to have no sodium nitrite added, as sodium nitrite is added to the pepperoni. Commendably, this jerky does qualify to have no MSG added. These basically uniform sized strips are round, and are sliced thin. 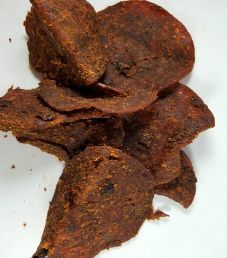 The texture is chopped and formed, or something similar, where there is no natural tear to these jerky strips. Chewing these strips requires a normal amount of effort. Handling these strips leave a slight oily residue on your fingers. The aroma of these strips is an overpowering pungent odor. The first tastes detected are an unbelievably strong blend of flavors. There is some resemblance to the taste of pizza, but only to a certain extent. It’s as if the goal was to make this flavor as bold tasting as possible, and went overboard. Way overboard. There is some taste of pepperoni, but more of a processed taste of pepperoni. The chili pepper flakes add a nice bit of spiciness. Between the five people who sampled this jerky, only Stephane could finish off this bag. I struggled to even finish a single strip. All of our taste ratings ranged from a 7 to a 3. We will just take it down the middle here, and award an Average (5/10) taste rating. This 2 ounce/57 gram bag cost $4.99. That works out to $2.50 an ounce, which rates as an average price. This resealable plastic bag has everything imprinted on the bag itself, both on the front and back. 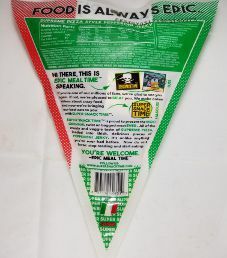 Some slogans printed on this bag are “Pizza In A Bag”, “Food Is Always Epic” “Hi There, This Is Epic Meal Time Speaking”, and “You’re Welcome. – Epic Meal Time”. 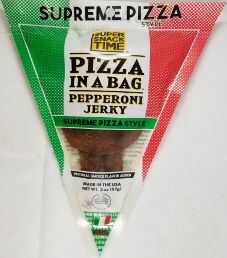 Some facts printed on this bag are “Supreme Pizza Style”, “Natural Smoke Flavor Added”, Made In The USA”, and “Supreme Pizza Style Pepperoni Jerky”. All bag categories are covered with this bag. A great blurb is printed on the back about this flavor. To the credit of Super Snack Time, a phone number is provided for customer inquiries.